A Fine pair of Cased Percussion Cloak Pistols by "J.Beattie, Regent St." The Case Lid plate inscribed: "Charles K. Sibley, Bengal Artillery." 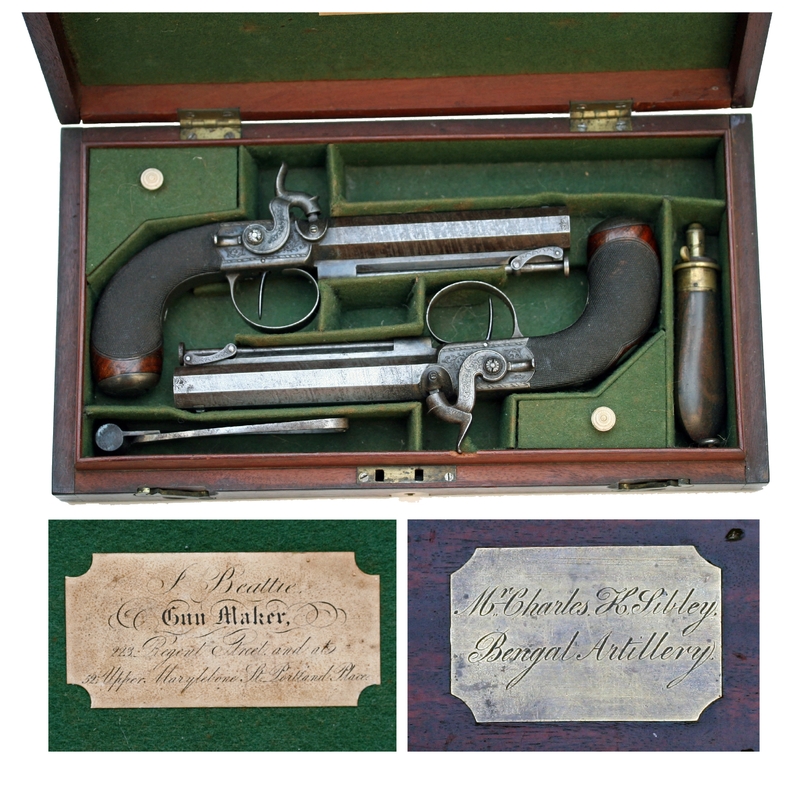 A Fine pair of Cased Cloak Pistols by J.Beattie, Regent St. Each Percussion Pistol having a twist pattern single barrel, swivel ramrod, box pattern lock, finely chequered walnut grips with metal grip caps containing an integral cap box with sprung lid, belt clip to side of barrel. Each pistol having a silver (White metal) escutcheon bearing the family crest of a lion holding a crown with the intitials CKS underneath. The Pistols contained in their original oak case together with a small pistol sized flask and a scissor mould (Both certainly contemporary and probably original). The interior of the case lid bearing the trade label of \"J.Beattie, Gunmaker, 223 Regent Street, the exterior of the case lid bearing a brass plate engraved \"Mr. Charles K. Sibley. Bengal Artillery\". Mr. Charles K. Sibley joined the Bengal Artillery in 1843, by 1847 he is working at the Royal Military Academy Woolwich, where he co-writes a book with the famous mathematician William Rutherford on Earthwork Tables for Fortifications and Railway embankments. It is believed that he was attached to the Royal Engineers during the Crimean War as a consultant, where he died around 1855. The whole in excellent condition, the pistols having much original finish. The case lid top shrunken slightly at front. Stand of Arms is the trading name of Chris Berry, a lifelong collector and U.K. based dealer. Well known and trusted on the Antique Arms & Militaria Fair circuit, Chris has more than 40 years experience specialising in Fine British, Colonial & American Antique, Classic & De-activated Firearms. Comprising Fine Quality items sourced from around the World, the stock is always varied and interesting, usually including a number of “Hard to Find” pieces. All items sold on this web site comply with current U.K. Law and may be owned as a “Curio or Ornament”. The purchaser is NOT required to possess a firearms license.